← I'm so proud of my girl. As we neared the top of Steven’s Pass, we came to an amazing sight. Cars and more cars w ere crammed into the ski area. So many, in fact, that they had people out there waving us latecomers off. So, we continued a bit farther to a fun little diner that we discovered last summer. It was all about the 50’s complete with photos of Elvis, Marilyn, James Dean and many other stars of the era plastered all over the walls. 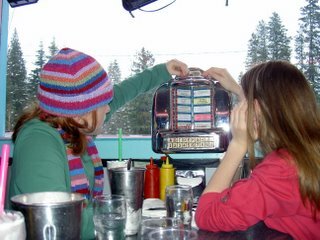 The very best part of the diner is the individual juke boxes at each table. (Not to mention the monster size shakes made the old-fashioned way.) It seemed as every other person that couldn’t find a spot at the ski area had the same idea as we did, so there was quite the wait. It was worth it though as we always enjoy the 59er Diner. When we headed back towards the ski area, we found that several cars had started to leave. So Shaun headed in, confident that he would have no problem driving on the packed snow with his 4 wheel drive. (Should I mention that we missed wiping out THREE cars, not counting our own by mere inches???) Anyways, went climbing up a hill to play for a bit (I still haven’t gotten over the fact that they wouldn’t let me wait for them in the car!) Between the snowballs flying and the snow angel making, we had a blast. Ok, so I wasn’t all that thrilled to find myself sinking up to my hips in snow, but they thought it was pretty amusing. It’s good to know that I’ve gotten my duty for the year over with so soon!